I had planned to bake some applesauce flavoured biscuits and was inspired to try a cake recipe, since the jar of unsweetened applesauce I bought was so large. I could tell from the recipe planning process that my cake would not taste sufficiently similar to the mini muffins of my youth and I was correct. That don’t even matter though, because this cake tasted so sweet and tangy. 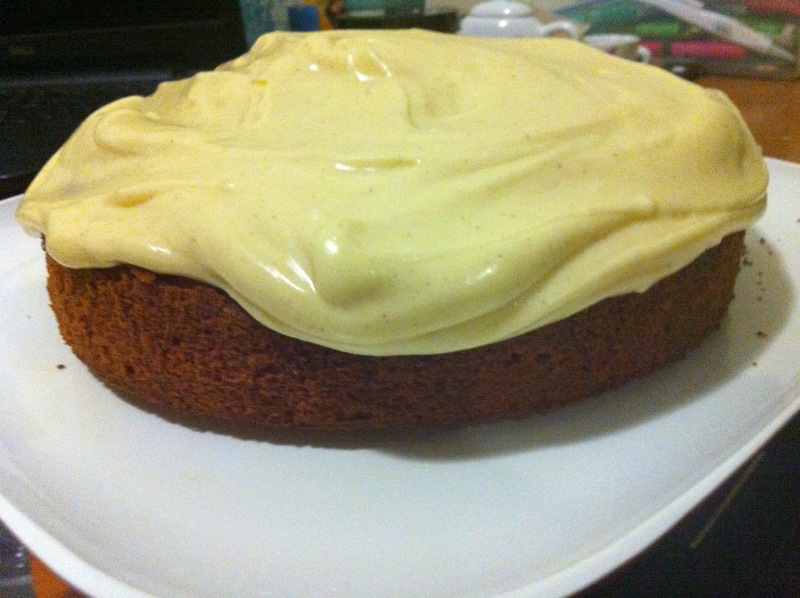 The tanginess came from the cinnamon infused cream cheese frosting. Mmm! A key difference between the apple spice mini muffins and this cake is that the muffins my family used to buy had chopped apple pieces baked into them. I wasn’t fussed about that, I just wanted to eat cake that had the flavour of applesauce in it and had sweet cinnamon in it. I didn’t re-read the third Harry Potter book while enjoying a slice of this cake but thankfully I did get to eat most of it myself. My grandmother only liked the frosting and my brothers and auntie had a single piece before I devoured it. It tasted great with coffee… Oh, yum. I’m going to make this again in the Autumn season. Preheat oven to 180°C with rack in middle. Grease 22 cm square cake pan. Combine the flour, baking powder, baking soda, salt, and spices. Beat butter, brown sugar, and vanilla with an electric mixer at high speed until pale and fluffy, 2 – 3 minutes. Add eggs one at a time. Make sure the mixture is being beaten well after each addition, and then beat in the applesauce. At low speed, mix in flour mixture until just combined. You might do this with a wooden spoon but it could take a while. The batter will probably look a little curdled and lumpy. That’s okay. It will smooth out in the baking process. Spread batter into the cake pan and bake until golden-brown for around about 40 – 50 minutes. A wooden skewer inserted into the centre ought to come out with no cake batter on it! Cool in pan for 15 minutes. 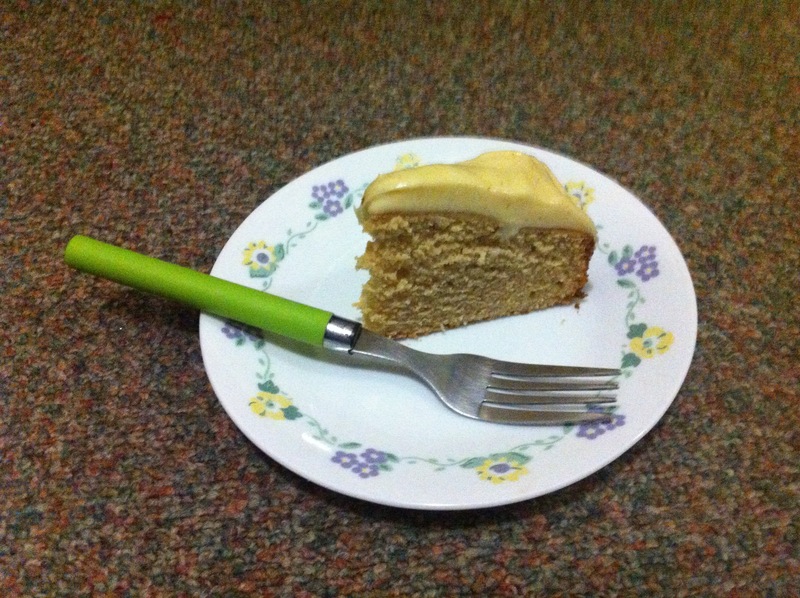 Run a knife around edge of cake (gently) to loosen, then invert onto a plate. For the frosting: Beat cream cheese, icing sugar, cinnamon, butter, and vanilla with an electric mixer at high speed until fluffy. 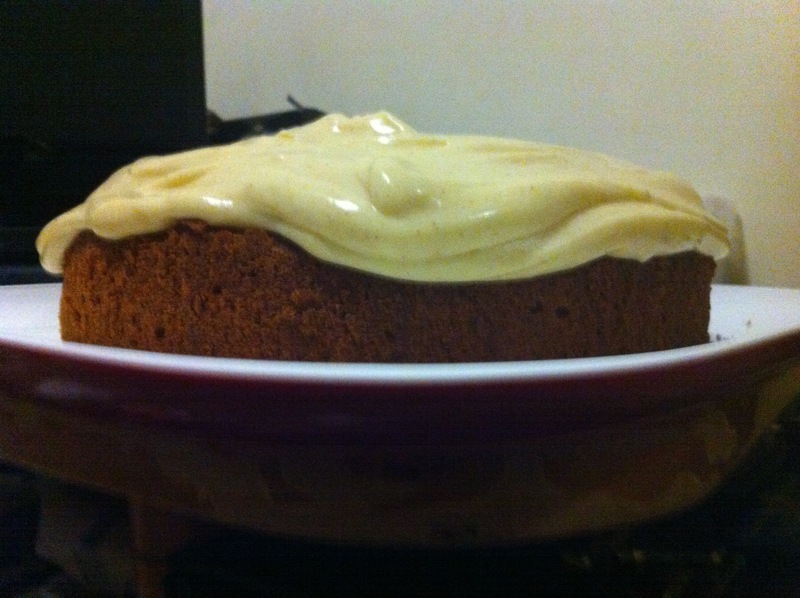 Spread frosting over top of cooled cake. Add ½ cup walnuts (optional), toasted, cooled, and chopped, at step four if you’d like. I plan to use them in future, but didn’t have them the first time I decided to make this. Add after you’re done using the electric beater. 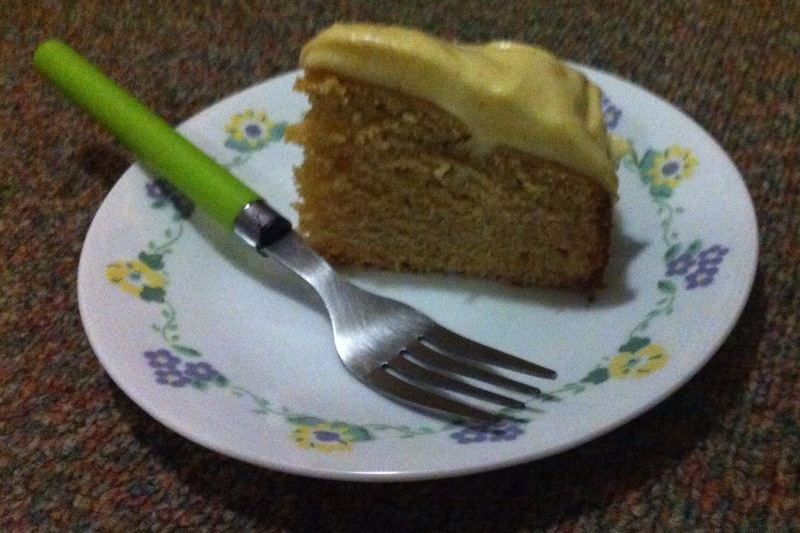 1/2 teaspoon of ground ginger and cloves would make this cake’s batter more spicy, but I wanted just the taste of applesauce and cinnamon in my one. Previous Post Spicy potato wedges. Next Post Garlic basil salmon fillet. Thank you. It was really lovely and even my grandmother enjoyed it, which surprised me.